[blog post] It’s conference season again! Greetings from Florida! The summer conference season has just started, and on both sides of the Atlantic, in Florida and France, physicists are meeting to share the latest news from the LHC and the Tevatron. I’m at the Eleventh Conference on the Intersections of Particle and Nuclear Physics (CIPANP 2012), and with 70 parallel sessions, 10 plenary sessions, and 64 posters there’s a lot to explore here! While the Higgs boson is a hot topic, it’s not the main focus of the conference, topics include neutrino physics, cosmology, nuclear physics, dark matter and hadronic structure. Physicists are chatting over coffee, catching up on gossip and rumors, and trying to find the time to fit in the most interesting talks. 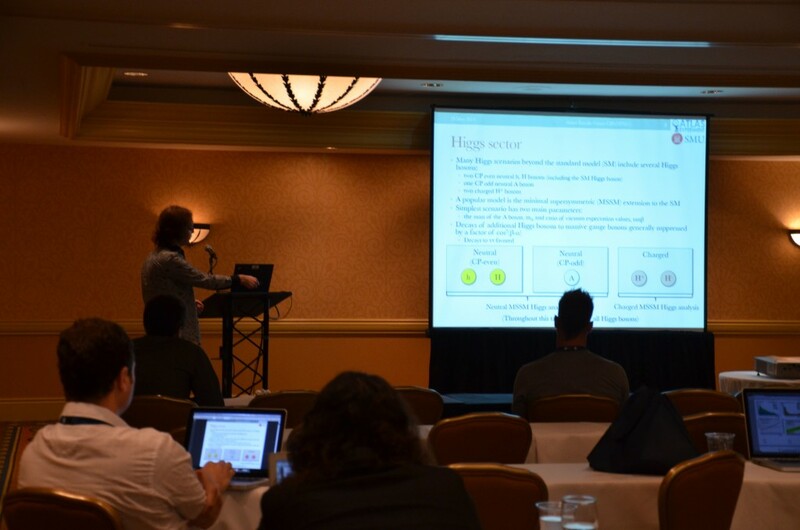 I delivered my talk yesterday (a whirlwind tour of Higgs bosons decaying to final states with tau leptons) so I can now relax and enjoy the rest of the conference. Given the diverse nature of CIPANP this is a great opportunity to find out about the other areas of physics. In the very low mass region there are extremely stringent tests of the Standard Model which keep getting better. It’s easy to forget that the most precise tests are not found at the high energy frontier, so hearing from colleagues who work with muons and neutrinos is vital.